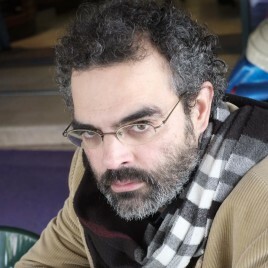 Gonçalo M. Tavares was born in Luanda in 1970 and teaches Theory of Science in Lisbon. Nobel Laureate José Saramago stated: In thirty years’ time, if not before, Tavares will win the Nobel Prize, and I’m sure my prediction will come true... Tavares has no right to be writing so well at the age of 35. One feels like punching him. Beside his work as writer, he teaches Theory of Science at a university in Lisbon. Tavares has surprised his readers with the variety of books he has published since 2001 and has been awarded an impressive amount of national and international literary prizes in a very short time. In 2005 he won the José Saramago Prize for young writers under 35. In his speech at the award ceremony, Saramago commented: JERUSALÉM is a great book, and truly deserves a place among the great works of Western literature. JERUSALÉM was also awarded the Prêmio Portugal Telecom de Literatura em Língua Portuguesa 2007 and the LER/Millenium Prize. His novel APRENDER A REZAR NA ERA DE TÉCNICA has received the prestigious Prize of the Best Foreign Book 2010 in France. This award has so far been given to authors like Salmon Rushdie, Elias Canetti, Robert Musil, Orhan Pamuk, John Updike, Philip Roth, Gabriel García Márquez and Colm Tóibín. APRENDER A REZAR was also shortlisted for the renowned French literary awards Femina Étranger Prize andMédicis Prize and won the Special Price of the Jury of the Grand Prix Littéraire du Web Cultura 2010. In 2011, Tavares received the renowned Grande Prêmio da Associação Portuguesa de Escritores, as well as the prestigious Prémio Literário Fernando Namora 2011. The author was also nominated for the renowned Dutch Europese Literatuurprijs2013 and was on the Longlist of the Best Translated Book Award Fiction 2013. He was also nominated for the International IMPAC Dublin award 2013 and, most recently, for the Prix Jean-Monnet de Littérature Européenne 2015. Gonçalo M. Tavares’ work has been published in over 45 countries.